Bugloss Blue Angel Anchusa Capensis is a biennial or short-lived perennial native to South Africa. Bugloss seeds can be started indoors in early spring or directly outdoors after last frost, and this upright growing perennial plant is often grown as a self-sowing annual. 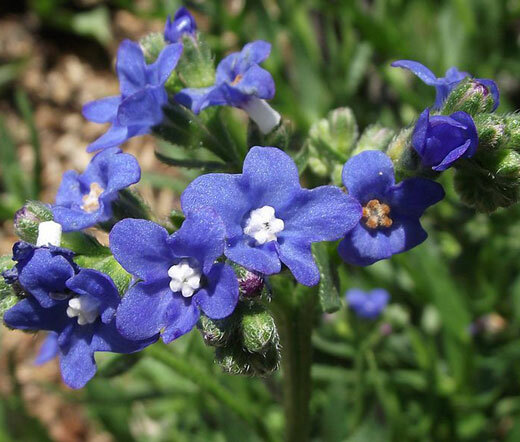 Bugloss Blue Angel produces very showy clusters of ultra-marine blue flowers on a top of bushy branching foliage. Anchusa Capensis is also called Summer Forget-Me-Not, and Bugloss flower blooms heavily all summer long attracting bees, butterflies and hummingbirds. Bugloss Blue Angel is perfect for sunny borders and mass planting. Bugloss makes a good ground cover and an excellent summer plant for rock gardens, containers, and pots. Anchusa Capensis seeds have to be planted not deeper than 1/8 inch, and this dependable perennial flower likes to grow in full sun and dry or moist, well drained soil. The established Bugloss is heat tolerant, and the plant adapts to poor soil conditions easily.